The Invisible Heard (or Herd) Around Us. I’m not sure why I first noticed them. Compensation for my dulling vision? A momentary spat of decongestion that loosened up my ears? An entomological bumper crop mirroring the fruit season? In any case…. there they were. Or weren’t, as the case may be. Many sounds. Little to see. Walk outside in just about any rural part of the County now and close your eyes. Just listen. How many creatures do you hear, besides any birds? Chances are that once you really start concentrating on the acoustic world you’re bathing in, you’ll realize it’s pretty noisy out there at the moment. There are the whines of Cicadas, the chirps of Ground Crickets, the droning trills of Tree Crickets, the static purr of Meadow Katydids, the self-proclaiming shout of the True Katydid.The members of the chorus vary by time and location, but if you begin to insect-watch with your ears, you’ll find a diversity of small creatures making big sounds. As I listened more, I began to wonder how many calls and callers I could identify. So I packed up camera, ipad/recorder, and net and set out into the fields and hedgerows around our office. I tried to just listen, but I also tried to nose about with my net for the callers. And I made recordings. And I analyzed recordings. Below, I’ll try to take you on a short auditory tour of the community of sounds outside my window. This is a very incomplete beginning, but it’s a start. 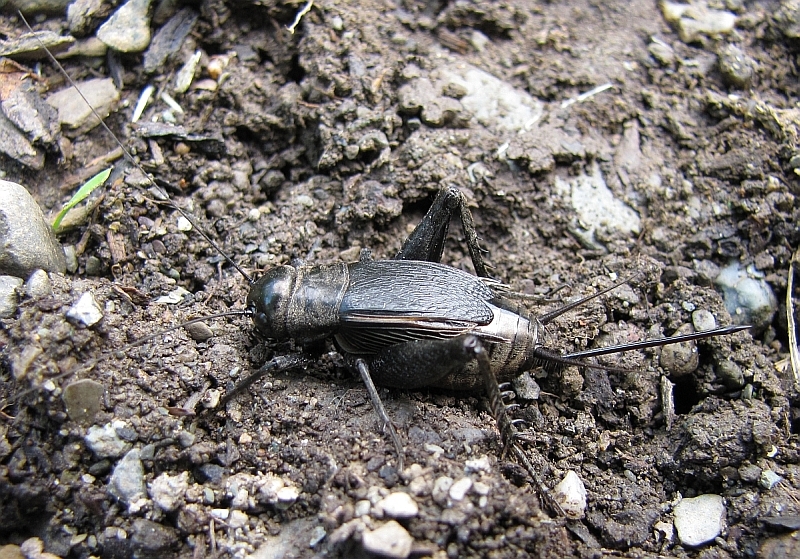 A Fall Field Cricket. 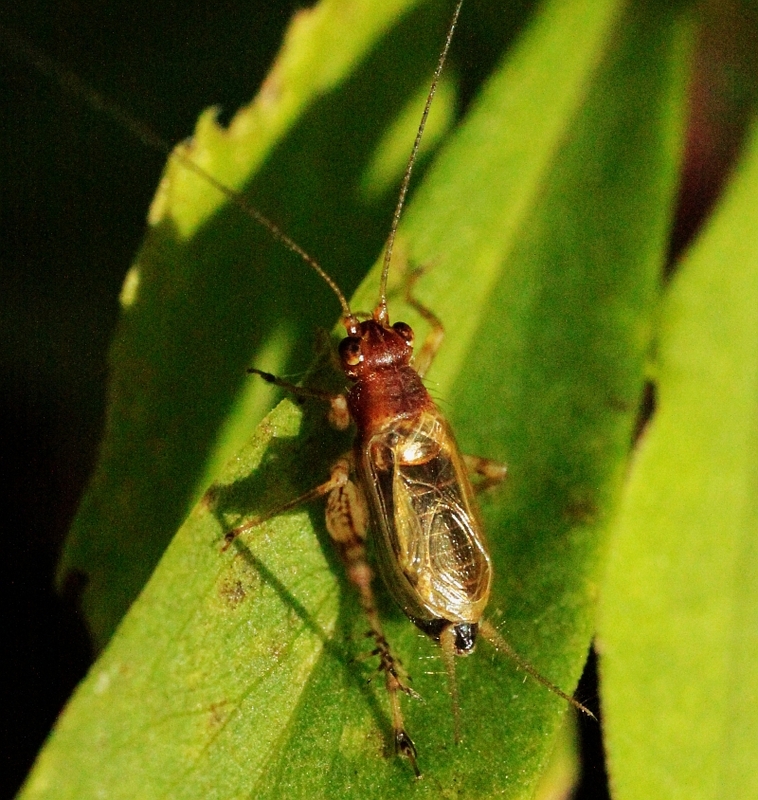 This time of year, this is the species responsible for the classic cricket calls. 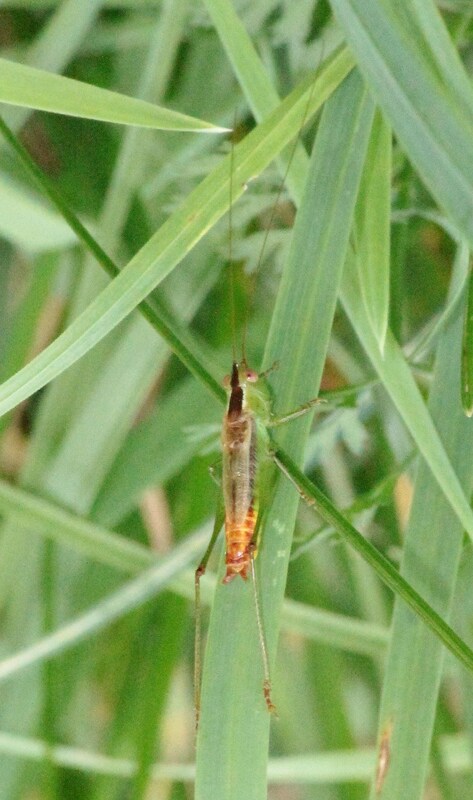 This individual however will not, personally, be making a contribution to the choir – she’s a female, note the long ovipositor (‘egg placer’) extending from her hind end. In the species we’ll discuss, males apparently do the singing as they aspire to attract mates. This is a so-called sonogram of the very same recording. Vertically, frequency (in kHz) is portrayed; horizontally, one sees time in seconds. The intensity of the green reflects the intensity of the sound. This cricket was chirping along between 4.5 and 5 kHz. (Just for reference, when I mumble my notes onto a recording, they appear at 1-2 kHz). Let’s move out of the ditch (that’s where this cricket was calling from) and into the hedgerow. We have a loud hedge. Not because of hot pink fuschias, but literally. Here’s what part of it sounds like. And here, again, is what that looks like. In the case of our noisy hedge, the loudest voice is proclaiming itself at 3-4 kHz. Who’s shouting? There are some great resources available for trying to ID calls (see ‘Crucial Links’ at the bottom); listening to their recordings and looking at their sonograms gave me some ideas. But netting is so much more fun. So, I flailed about the hedge with a sweep net, tangled with some roses, and came up with the creature below. This somewhat delicate-looking (must be the lacy wings) creature is a Black-Horned Tree Cricket. Reassuringly, the Song of a Black-Horned Tree Cricket (sounds like it should be the anthem of some fun country) is a loud trill at about 3.5 kHz. What we’re hearing and seeing is not the call of just one such cricket, but rather the grand choral presentation of many individuals. Leaving the hedge and the ditch, I wandered out into the field with Otter, our son. Keen-eyed and keen-eared, he spotted this grasshopper-like fellow (and we do know he was a fellow) proclaiming himself. A Short-winged Meadow Cricket. I cropped this photo so as to include the long antennae. This is one of the most obvious traits that tells you this is not one of our generally silent (except for some raspy flights) grasshoppers. The Meadow Katydids have long, wispy antennae. This species in particular has short wings which leave exposed the orange rump. What do you suppose this critter sounds like? Any thoughts on what sort of noise you could imagine it producing? Unadulterated sonogram of a Short-winged Meadow Katydid. I did not ‘clean up’ this call. In part, because it was a great, up-close recording, but also because, given the blurred, raspy nature of this call, its sound spans many frequencies. To end off this blog, I’ll go back to that first recording of the complex sound environment outside of our door. We’ll try to partition it into some of its component songsters. I do this not because the whole isn’t pretty, but because I think one of the keys to learning insect songs is not only appreciating the whole orchestra but also beginning to distinguish the different players. In listening to the sounds in that landscape, who do you hear? A sonogram of the sound in our front yard. This is a multi-species presentation. Let’s look at some of the presenters. What about the contributor that sounds like this? (I’ve taken the above recording and isolated the different frequencies.) His part is highlighted below; As I’m sure you heard, it’s our cricket from earlier. Or what about the faint but diligent performer who sounds like this and whose part of the sonogram is outlined below? At least in part, this is probably a distant version of the Black-Horned Tree Cricket we met earlier. But clearly, there are more chefs in our stew pot. How about this one? I’m going to guess it’s a cricket of sorts – perhaps??? a very rhythmic Allard’s Ground Cricket. And then what of this one, cruising along in overdrive? I am really unsure, who do you think made these sounds and some of the others which I didn’t pull out? The Singing Insects of North America Web Site – photos, maps, diagrams, recordings, the whole kit and caboodle. Because it has so much info., it’s best used in conjunction with the following two books that help you narrow down the possibilities to species of our region. Guide to Night-Singing Insects of the Northeast – John Himmelman of mothing and kid’s books prowess together with Michael DiGiorgio describe and illustrate many of our night (and day!) singing creatures. John kindly fielded a query on one of my mystery sounds and provided encouragement. The illustrations and descriptions make this book great for figuring out what was in my net. The book includes a CD. The Songs of Insects – Lang Elliott, ace bird recorder, and Wil Hershberger produced this photographically and sonogramically illustrated guide to many of our singing insects. The sonograms and range maps helped me quickly narrow down my options. The book includes a CD, files from which are also on the web page. 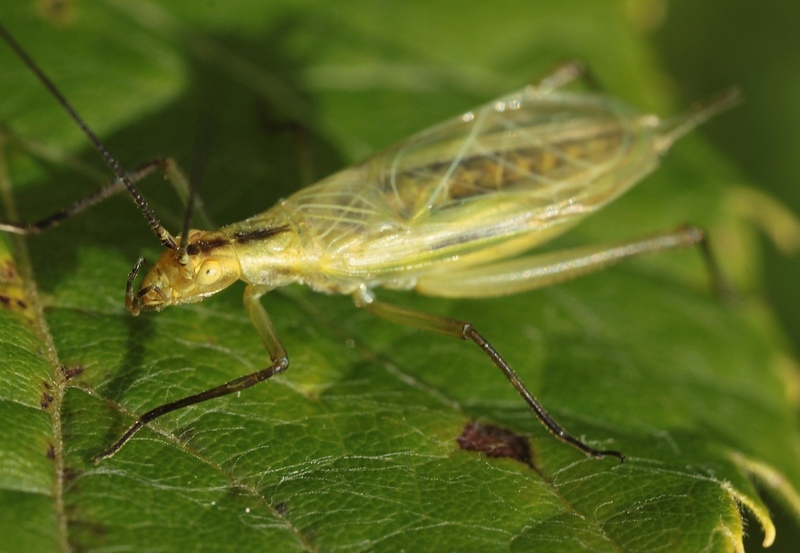 Cricket Radio – John Himmelman’s book on, as he puts it, “Why are these insects singing, and more importantly (to us, not them), why should we tune in those sounds?” A pleasant stroll around our auditory outdoors. The book’s web page includes sound recordings. Crickets and Katydids, Concerts and Solos – the late entomologist Vincent Dethier’s last book; a retrospection on summers spent searching for sounds. True confessions, I’ve just started this book, but it’s lovely so far, and comes highly recommended. All songs were recorded using my ipad2 using the Oxford Wave Research’s Spectrumview app; the app is a bit buggy (but hey, that’s what we’re after). It was great fun and highly workable after a little practice. I used the settings of sample rate 44100, Fast Fourier Transform order of 11, and a frame averaging of 1. These won’t make any sense to you unless you use the app – they still don’t make much sense to me – but they produced the recordings and sonograms I was looking for. I then downloaded those .wav files to my PC via itunes and the app’s file page. Next, I brought those into Raven Lite, a nice, free sound analysis and editing program for Windows. I made the sonograms shown here and electronically dissected the recordings using that program. Have fun. If you try this and have problems, I’d be glad to help you get as far as I got. Hopefully, you can then go well beyond that! I’d love to hear whom you find. 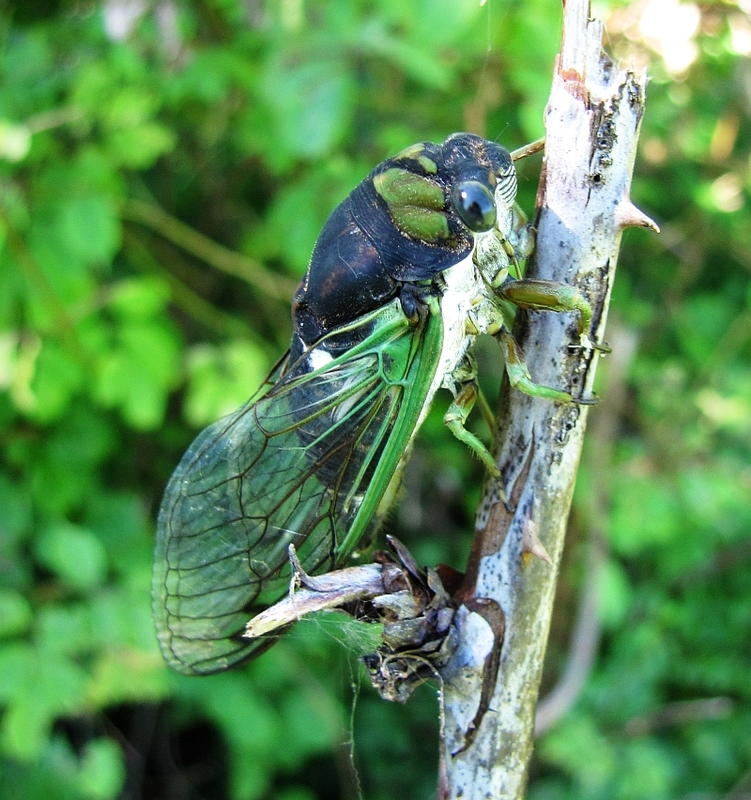 I was going to end with the portrait and sound of this Swamp Cicada, but the digital dog ‘ate’ my homework, so no recording yet. But, perhaps this blog is worth a sequel – heck, we’ve not even covered the Night Callers yet!